Girls: Solid color leotard, light pink tights (optional), pink ballet slippers, hair in a bun. Boys: Stretch Pants, Sweat pants, shorts, t-shirt, tank top, black or white ballet slippers, long hair pulled back. Ballet slippers can be purchased through Ms. Lisa for $20, at Payless Shoes at Wheatley Center or at www.DiscountDance.com. Click "Buy/Sell" as there are many new and used items for sale. Ladies: solid color leotard, black or pink tights, pink ballet slippers, hair in bun. Men: Compression Running Pants/Shorts, Sweat pants, shorts, t-shirt, tank top, black or white ballet slippers, long hair pulled back. Ballet slippers can be purchased through Ms. Lisa for $20, at Payless Shoes (limited large sizes available) at Wheatley Center or at www.DiscountDance.com. Click "Buy/Sell" as there are many new and used items for sale. Girls: Stretch pants, yoga/spandex shorts, tank tops, sports bras, leotard/tights, hair pulled back, and bare feet/socks/jazz shoes. Boys: T-shirt or Tank Top, shorts or basketball shorts, long hair pulled back, and bare feet/socks/jazz shoes. Please purchase the slip-on jazz shoe versus the "tie" jazz shoe, if possible. Payless Shoes at Wheatley Center or www.DiscountDance.com. Also, click "Buy/Sell" as there are many new and used items for sale. Girls: Stretch pants, yoga/spandex shorts, tank tops, sports bras, leotard/tights, hair pulled back, socks (for comfort), tap shoes. Boys: T-shirt or Tank Top, shorts or basketball shorts, long hair pulled back, socks (for comfort), and tap shoes. Tap shoes may be purchased at Payless Shoes at Wheatley Center, on-line or Ms. Lisa sells new shoes size 4+. Also, click "Buy/Sell" to see new and used items for sale. Ms. Lisa also has spare tap shoes for you to borrow during class. If you have multiple members of one family signing up for lessons, please put all family member's names in the box. MON 5pm @ GM. $36/6 classes, 6 spots left. SAT 10am @ GM. $36/6 classes. CLASS IS FULL, add me to waiting list SAT 11:05am @ GM. $36/6 classes. *** New Class!!! 6 spots left. MON 4:30pm @ GM. $36/6 classes. CLASS CANCELED due to low enrollment MON 5:35pm @ GM. $36/6 classes, 4 spots remain @ GM FRI 3:15-3:45pm @ VICM. VICM Members $36/6 classes Non-Members $$84/6 classes, 5 spots left. SAT 9:30am @ GM. $36/6 classes, 1 spot remain SAT 10:35am@ GM. $36/6 classes, 2 spots remain SUN 4:30pm @ GM. $36/6 classes, 5 spots left. Ballet age 5-10. MON 6:10pm @ GM. $36/6 classes. 4 spots remain. Ballet age 5-10. WED 5:45pm @ UVI. $36/6 classes. 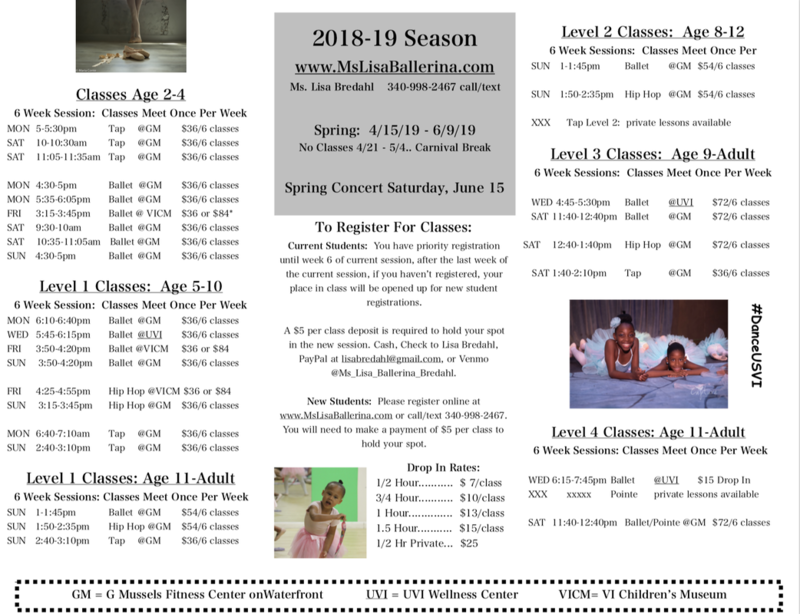 7 spots left Ballet age 5-10. FRI 3:50-4:20pm @ VICM. VICM members $36/6 classes. 1 spot left Ballet age 5-10. SUN 3:50pm @ GM. $36/6classes. 5 spots left. Hip Hop age 5-10. FRI 4:25pm @ VICM. member: $36/6 classes, non-members must pay entrance fee. 1 spot left. Hip Hop age 5-10. SUN 3:15pm @ GM. $36/6 classes. 5 spots left.